Contribute a species | Medicinal plants | Plants of commercial importance | Plants of religious significance | Family-wise list of plants | More plant lists.. The Plant species pages which were recently created are listed here automatically. A total of 303 plant species in the database as of this moment. 104 have some information filled in. 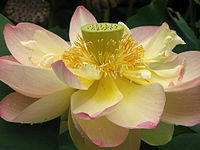 Sacred Lotus (Nelumbo nucifera), which is the national flower of India, has these very beautiful flowers which bloom in the morning and close at night, to bloom again in the morning. These plants are pollinated by beetles and other insects. In order to attract these insects, the flower not only produces fragrance, but also heat. Since these flowers grow on water, the heat makes the internal floral chamber much warmer than its surroundings. Interestingly, for producing this heat, the Lotus flower uses an alternative respiratory pathway involving an Alternative Oxidase (AOX) enzyme. This enzyme, instead of using the electrons generated in respiratory process to make water (as it happens regularly), releases them as heat. This simple bypass allows the plant to emit heat thereby allowing the plant to attract its pollinators. Several groups of plants use this strategy to attract their pollinators and are called thermogenic plants. This page was last modified on 19 September 2011, at 13:15.